Another Hot Autumn RE Market? After the usual late summer slowdown, the typically very active autumn selling season is relatively short, running from mid-September until mid-November, when activity begins to plunge for the mid-winter holidays. 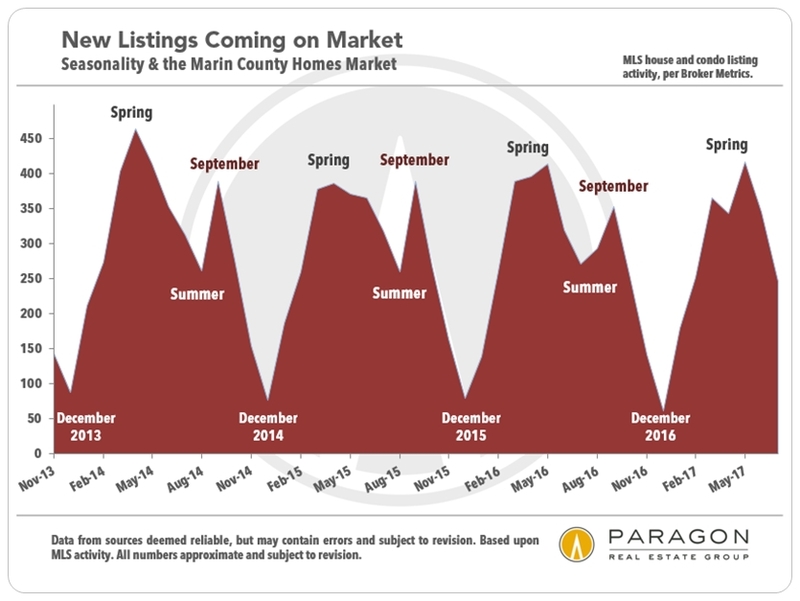 The coming two months will be the next major indicator: Will the Marin homes market continue to maintain the intense high-demand, low-supply heat of this past spring, or will it start to shift and cool? 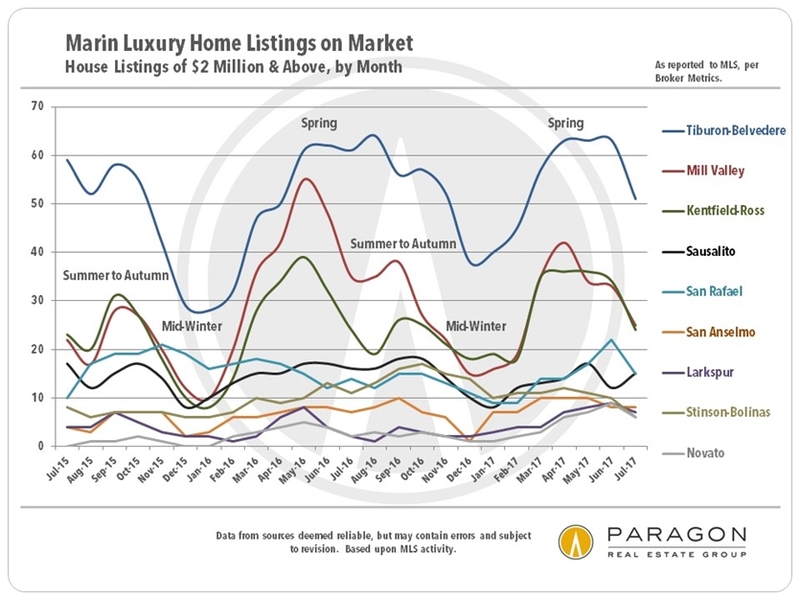 While the entire market is significantly affected by seasonality, the luxury home segment is fiercely so, and September/October will be the peak selling period for high-end homes until spring 2018 rolls around. The appreciation of home prices in the Bay Area since 2011 has out-performed overall state and national markets by a substantial margin. 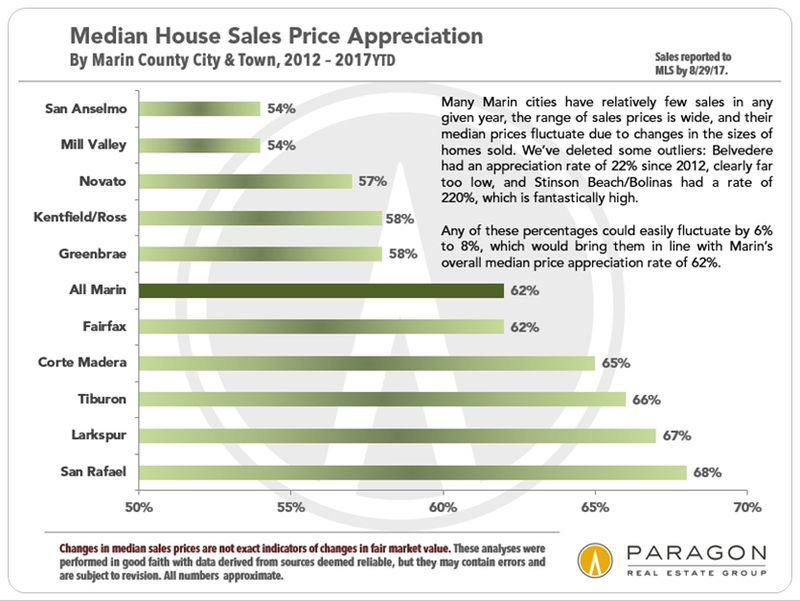 Median sales prices are not perfect indicators of changes in values for specific homes: They can be and often are affected by factors other than changes in fair market value, and shorter-term anomalies are not uncommon. In the more expensive communities especially, the average size of houses sold in a particular period can sometimes vary considerably. What is certainly true is that every part of Marin County has seen large-scale appreciation since the recovery began in 2012. This next chart illustrates the striking ebb and flow of activity by season. September usually sees the last big surge of new listings hitting the market before the year ends, and that surge fuels most of the sales in the autumn season. Generally speaking, the higher the demand, the greater the competitive bidding, which is what leads to sales prices going over asking prices. Almost all the SP-OP percentages in the area during the feverish Q2 market were high by historical standards. It is not uncommon for more expensive home markets to have lower SP-OP percentages than the more affordable cities, but there are a number of factors at play. 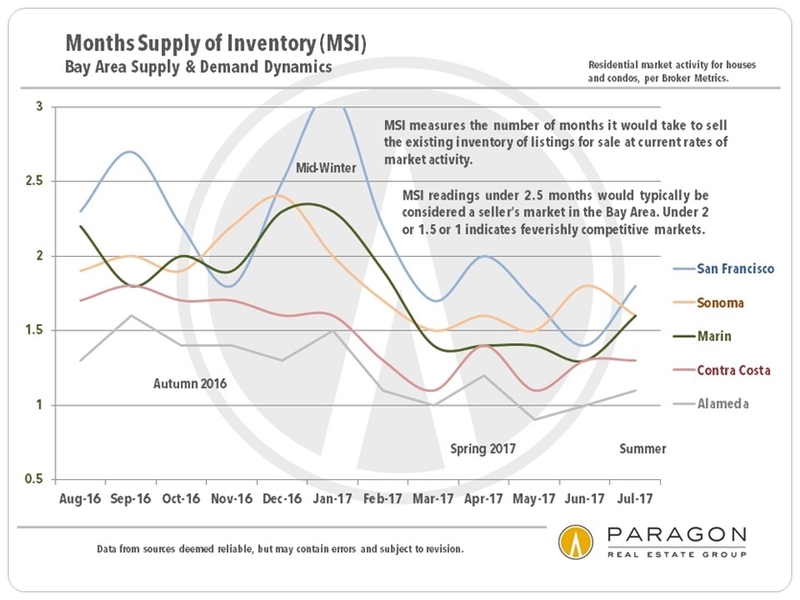 The lower the months supply of inventory, the higher the demand as compared to the supply of homes available to purchase, i.e. a lower MSI equals a hotter market. 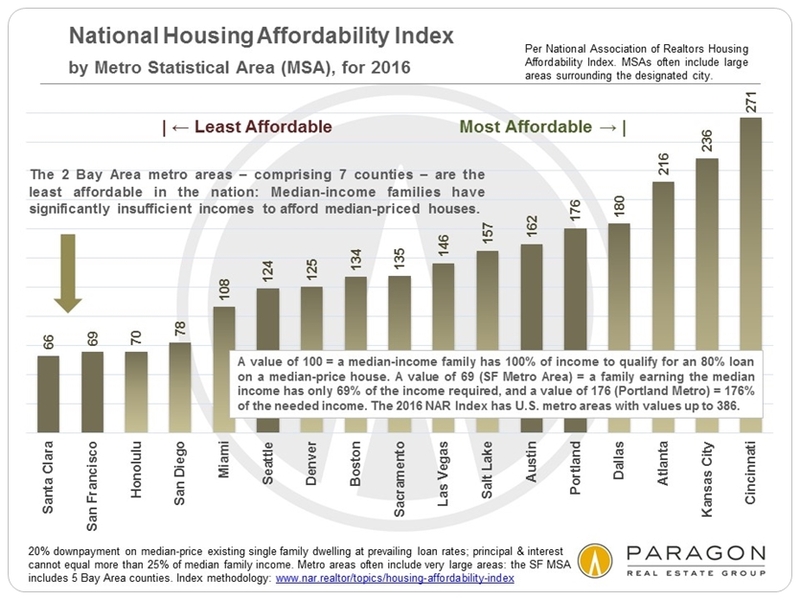 The entire Bay Area has been experiencing very, very low MSI figures recently, but typically the less expensive inner counties (such as Alameda and Contra Costa) have been seeing the extreme lows, with more expensive markets somewhat higher. 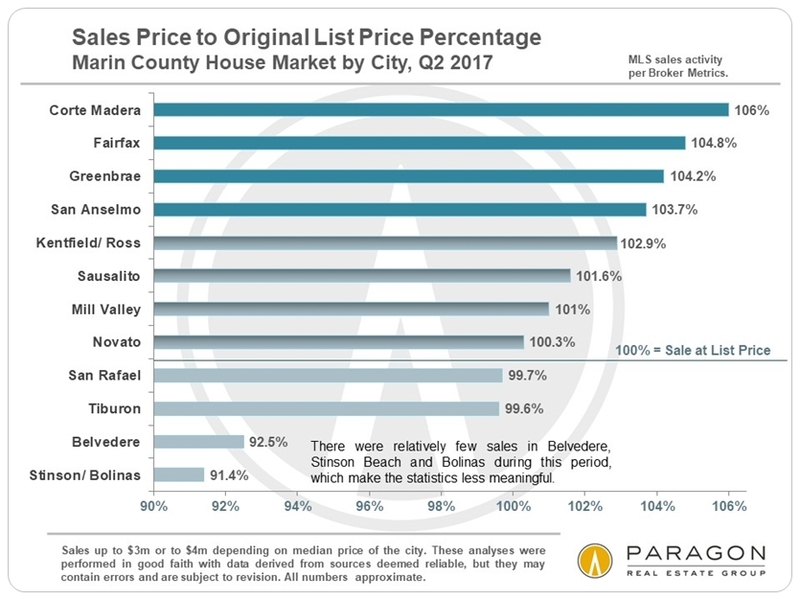 Within Marin, the MSI in the more moderately priced communities, usually experiencing the highest pressure of buyer demand, have generally been lower than in the more expensive cities, though all areas have seen low MSI figures since spring began. Since San Francisco is considered the big city in the Bay Area (though San Jose is actually larger), it seems counter-intuitive that its house market is one of the smallest. Marin is just slightly lower, even though its population is about 70% less. Owners in the Bay Area (and the nation) are getting older, and selling their houses ever more infrequently, and new house construction has lagged well behind demand. Condo sales now dominate the SF market. 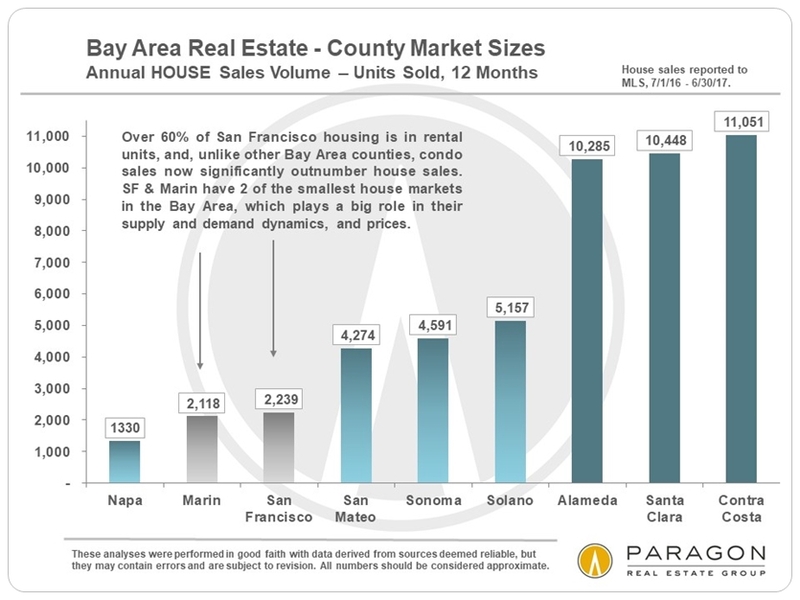 These are major factors behind the supply and demand dynamics prevailing in counties around the Bay Area. 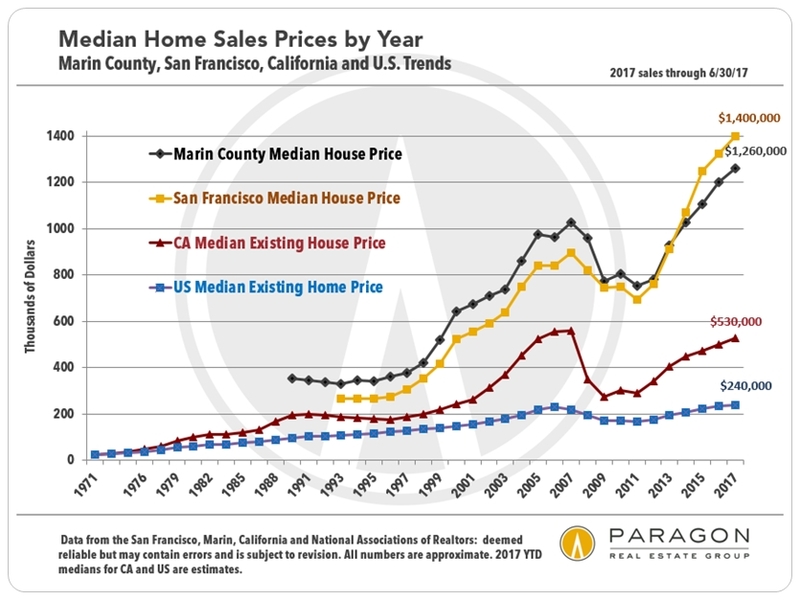 Earlier in this report, it was mentioned that median price changes can be somewhat unreliable as exact indicators of appreciation of fair market value. 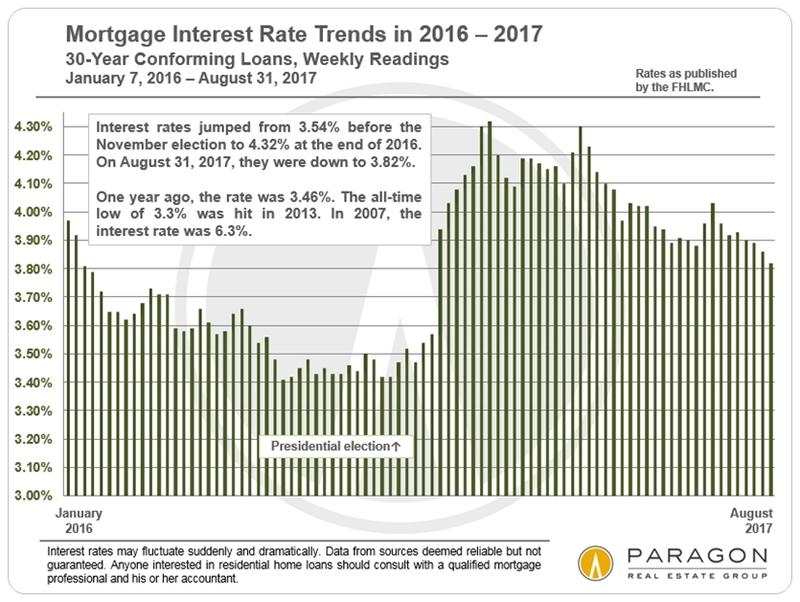 However, the S&P Case-Shiller Home Price Index measures appreciation using its own special algorithm tracking resales of the same home. 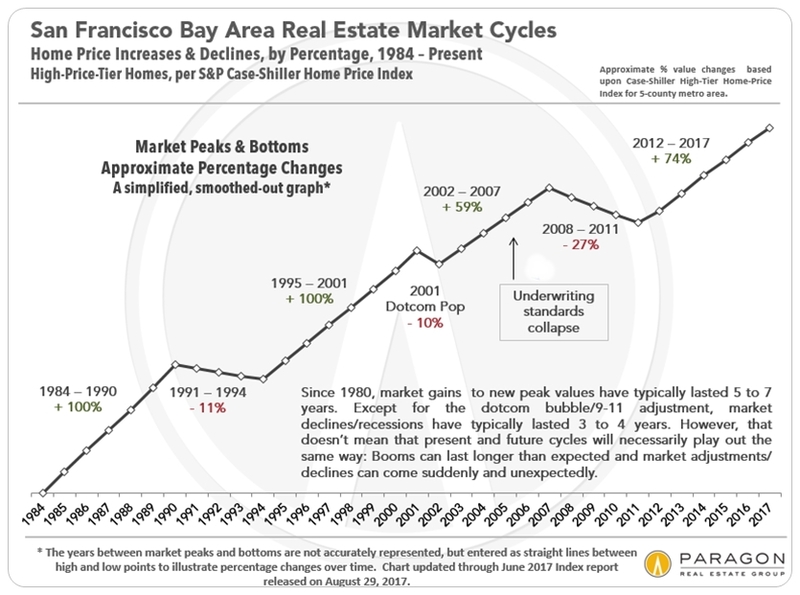 This first chart below, based on Case-Shiller, is a simplified, smoothed-out look at the up and down cycles over the past 33 years in the higher end of the Bay Area real estate market, which predominates in much of the city, Marin, San Mateo, as well as enclaves in Alameda and Contra Costa. 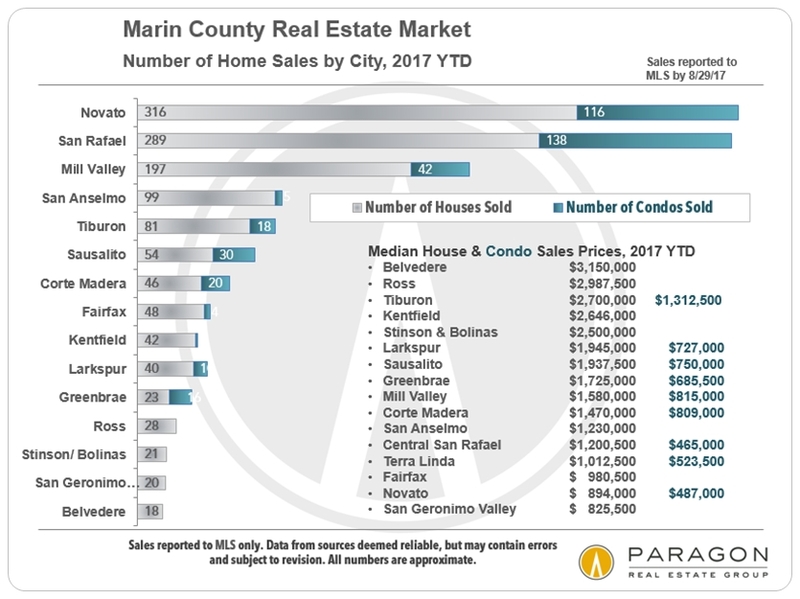 Because the Index covers 5 counties, it merges the differences between their separate markets into a single trend line: SF and San Mateo, the centers of the high-tech boom have recently, in this latest rebound, had somewhat higher appreciation rates than Marin. However, as indicated earlier, Marin has still seen very dramatic increases since the recovery began. 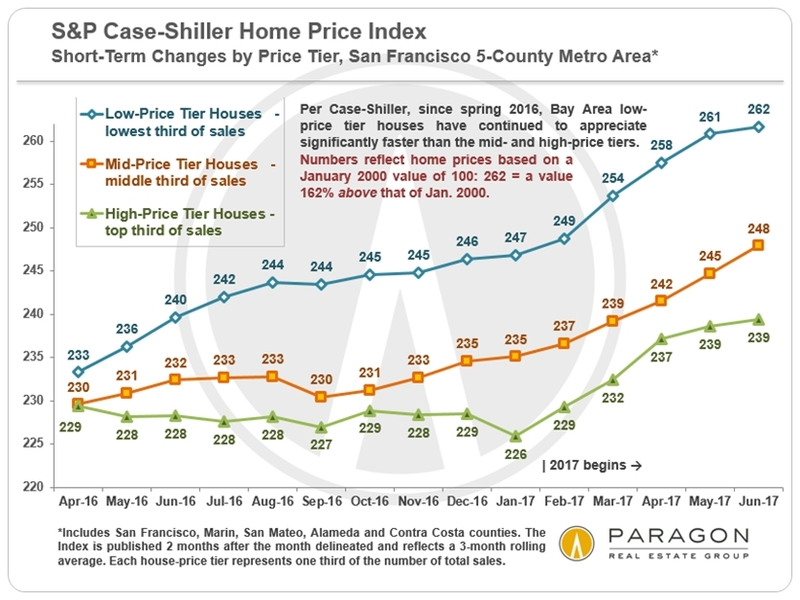 This second Case-Shiller chart illustrates how homes in different price segments around the Bay Area have recently been appreciating at considerably different rates. C-S divides all the Bay Area house sales into thirds by number of sales: low-, mid- and high-price. As illustrated in the lower green line, the higher-priced segment went flat in appreciation in 2016, but then jumped back to life in 2017. The most affordable price segment (top blue line) has been experiencing the highest pressure of buyer demand and competitive bidding, and since April 2016, has out-appreciated the high-price segment, 12.4% to 4.3%, i.e. almost triple the rate of increase. The mid-price segment (gold line) has been in between, appreciating by 7.8%. This dynamic is generally true within each county, as well as in the Bay Area as a whole, as buyers search for homes they can still afford in the area they wish to live.